A Jones fracture, also known as a fifth metatarsal fracture, is an injury to the fifth metatarsal bone of the foot. The fifth metatarsal bone lies at the base of the small toe, and the Jones fracture occurs in the midfoot area (the top of the bone), towards the ankle from the base of the small toe. This injury was first described in 1902 by Sir Robert Jones in an article titled "Fractures of the Base of the First Metatarsal Bone by Indirect Violence." He included descriptions of six patients (one being himself) who sustained fractures in this area without a direct impact (his injury reportedly occurred while dancing around the Maypole). This article included fractures we now classify as avulsion fractures, stress fractures, and what we presently refer to as a Jones fracture. Patients who sustain a Jones fracture have pain over this middle/outside area of their foot, swelling, and difficulty walking. Most often a Jones fracture is caused without significant injury or impact, but sometimes it can be acute (as with Dr. Jones) and seen during pivoting in football or basketball when the heel is off the ground. Often there has been a gradual build-up of pain in the area and eventually, it reaches a point where you have difficulty walking and you decide to see the doctor. This can be weeks to months since you first started feeling the pain. You may also not swelling and discoloration in the area. Your doctor will do a physical examination and listen to the history of your symptoms. You will probably get an X-ray, which will help differentiate Jones fracture from a stress fracture or an avulsion fracture and from os peroneum. The location of the fracture aids in the diagnosis. 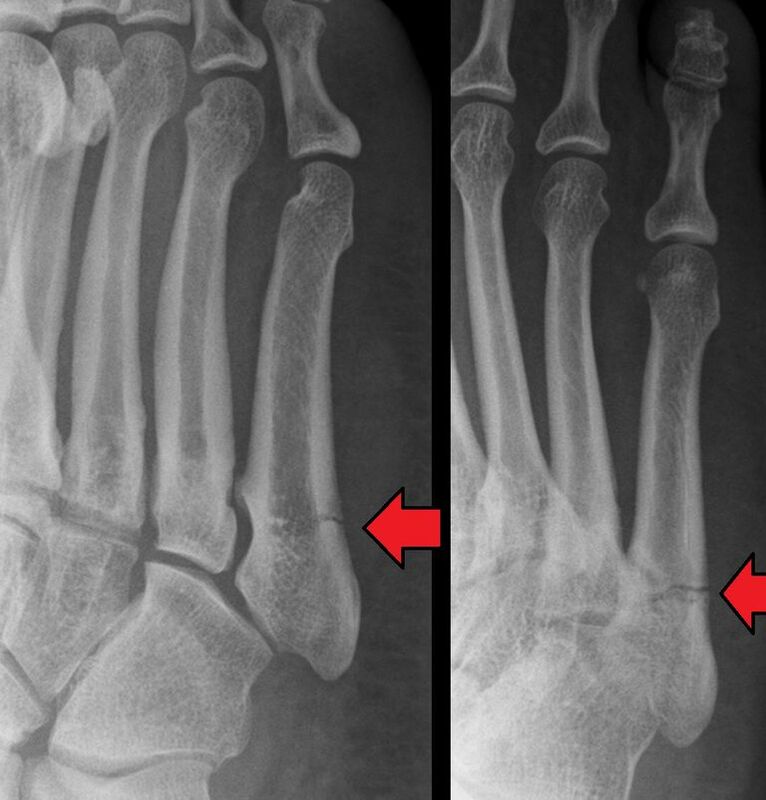 Jones fractures are in Zone 2 of the fifth metatarsal, while avulsion fractures are in Zone 1 at the base and stress fractures are in Zone 3 along the shaft of the fifth metatarsal. Treatment of an acute Jones fracture consists of immobilization with a cast. Patients should not place weight on the foot until instructed by their doctor. Crutches will be used for the initial healing phase, which may be six to eight weeks. Jones fractures can become chronic conditions if the fracture fails to unite or heal. If this is the case, surgery will likely be recommended to secure the fracture in place with a screw, and bone graft may be used to stimulate a healing response. In some patients, especially competitive athletes, surgery may be recommended to try to avoid the lengthy healing period for a Jones fracture to heal. Surgery has associated risks that must be weighed against the need for timely healing. Talk to your doctor if you think surgery may be needed in your situation. Fifth Metatarsal Fracture Surgery, American Orthopaedic Foot & Ankle Society. Scott M. Strayer, Fractures of the Proximal Fifth Metatarsal, Am Fam Physician. 1999 May 1;59(9):2516-2522.